Two levels of government have teamed up to invest $65 million in improving a high-traffic interchange in Mississauga. The provincial and federal governments announced Monday that they will each contribute $32.5 million towards the rehabilitation of the Queen Elizabeth Way at Dixie Road. "It's a little bit clumsy in terms of the actual way traffic flows on and off of this highway," Ontario Transportation Minister Steven Del Duca said at a news conference next to the QEW on Monday. "This was identified as a provincial priority under the (Provincial-Territorial Infrastructure Component) opportunity in our submissions that were made last December." Del Duca said the project is expected to take a number of years, but said that all six lanes of traffic will be available to traffic during "regular business hours." He said any necessary lane closures would take place during off-peak hours. "Once completed this project will provide improved safety, better traffic flow and ease congestion," federal Transportation Minister Lisa Raitt said Monday. "It's going to allow for reliable and faster commute times." The area is one of the oldest sections of the QEW, dating back to the 1930s. The Dixie Road section was analyzed in a report by the MMM Group, a construction project management organization hired by the Ontario Ministry of Transportation. "We need to invest in strong public infrastructure today to promote economic growth," Del Duca said. 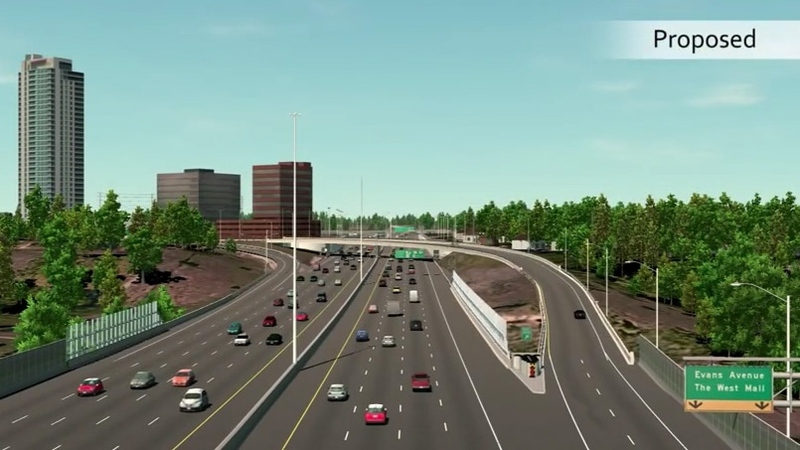 An artist's rendering shows the proposed changes to the QEW at Dixie Road.